It was a big weekend, from a Friday evening affair in Boone and to a Saturday afternoon of laying floors and then a Sunday morning dance thing in G'boro, the weekend was packed with good times, hard work, and cockroaches. FYI: the Comfort Inn @ exit 216 in Greensboro, NC is infected with "what the f-ers cockroaches?". I thought it was funny. Youngest lost her sense of humor about the time my husbund squooshed one above her bed. 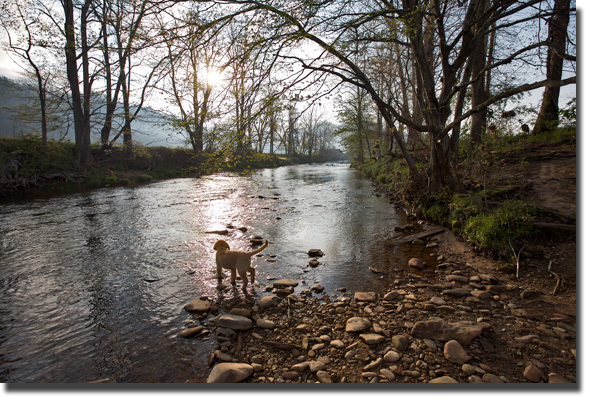 I did find time on Saturday morning to take Annie for her first tromp around Valle Crucis Park and the Watauga River. She delighted at the offering of new smells at the park and on the water's edge. 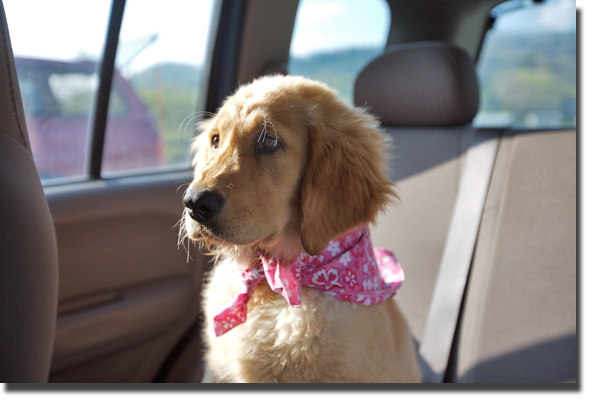 After our walk I wrapped a new gifted kerchief round her neck, an offering from one of the Mast Store fairies, and took her photo before she freaked out at being in the car. She still hates riding in a vehicle. She slobbers. She shakes. But is getting less so each time we venture out.